2013 has been busy, busy, busy! Working five days a week after working four for a good few years. Sorting out a mess left by the previous accountant and keeping up with tight deadlines set by head office in Belgium. I didn’t want to let anything go, but one or two things have slipped. Things are a little steadier now than they were, and I’ve reached a point where I can take a week off, so it’s time to take stock. Reading is important to me, so is writing about books, and I want to go on visiting other bookish places, but I need to tidy up, simplify, and get organised. A few pages that I didn’t really need and rarely looked at have gone. My reading history pages are now bang up to date. I’ve simplified my sidebar, and there’s a little more work to be done there. My ‘Who Am I?’ page needs a bit of work too. One day I’ll overhaul my categories and tags too. Oh, and I’ve promised Briar that she can have a page of her own, with a few photographs and an index to her posts. I’m reading as much as I ever did, but knitting rather less at the moment. So I have quite a few books to write about next week, in between spring cleaning the house, giving Briar some nice jaunts, a day trip to Truro to look at some different bookshops …..
What a nice sleek look! I’m looking forward to seeing Briar’s page as well. Love your new look and am very happy that Briar will get her own page! I was playing around with a 3-column format yesterday, but haven’t made the change… yet. Jane, what an elegant new theme! 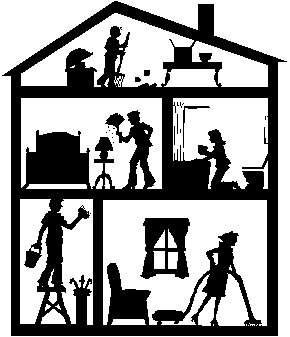 and I love the image of housecleaning – even it looks elegant. I’ll look forward to Briar’s page too. The site is looking good Fleur. This looks lovely Jane, very nice and classy! Looking forward to Briar’s page too. I am really liking the new look Jane – a pleasure to view.